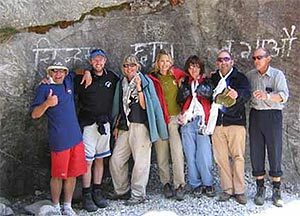 Last Trek Report – February/March 07 - Trekking in Nepal with Teresa, Slow Trekking for peoples of all ages. Wow! Did we have the best trekking season or what? Five adventurous types took on the trek to Muktinath in the Anapurna range near Pokhara this February. Six people made up the multi-national team that did the Everest Trek, ranging in age from 25 to 75. Nobody was disappointed and I rather think some people had the trip of a lifetime. Kathmandu in mid-February. The weather was still cool at night as the Trekkers shopped for gear and checked out the sights. In Pokhara we tested our legs on a short day-walk to the Peace Stupa, across the lake by boat. Everyone handled it just fine so we packed our kit into our rucksacks, undertook the pre-trek briefing and introduced the porters. They’ve all been with us for years now and they know how we operate – one porter per person. A short bus ride through winding mountain roads brought us to Nyapul. A dump! We walked straight through this ‘crummy but interesting’ road head village and were off into the hills. The spring wheat was just greening the terraced hills and farm folk called out ‘Namaste’ as we passed. Not a hard day but it was our first day on trek so we arrived in Tirkedungha pretty tired. The lodge is the old, traditional style and the food was good. An Ayurvedic masseur appeared. Yes please! One of our group, Euthy from Ivanhoe, reckons a ‘chaneller’ she met on the plane told her this would happen so she was gob smacked when the masseur appeared at her door, just as foretold. 3,000 old stone stairs make the trail up to Banthanti. Helen from Gardenvale did it the easiest. Her decision to work with a personal trainer prior to the trek really paid off. We arrived at our lodge mid-afternoon after a long sunny, boots-off, lunch in Ulleri. Happy to have the fire lit that night. Next day was still uphill but gentler now and through shady rhododendron forest. This is ‘hobbit country’ with little streams and pools in the forest making lovely rest stops. We arrived in Gorepani to a cool, cloudy evening so none of the customers suspected the stunning views awaiting them in the morning (even from the bedroom windows). As usual at this lodge, we cranked up the music after dinner and got into the local style of dancing. A lot of young, groovy types watched with their mouths open while ‘mature’ Australians showed them how to have a good time. Those who climbed Pun Hill next morning will never forget that view. I left Helen there to sit and meditate in this gorgeous spot. A late start for day four; leisurely brekky then downhill for a couple of hours. Easy walking and we were in our lodge, the Serendipity, by early afternoon. 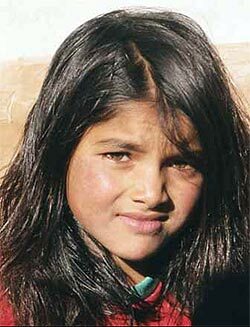 Lucille from Alice Springs had formed a great friendship with her porter Bijay and left us for dead on the trail. Solar hot showers – lovely! Day five was downhill almost all the way. 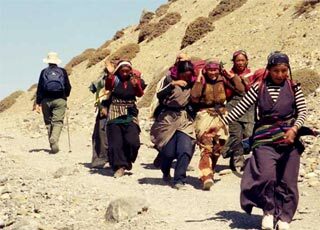 We saw large families of Lo Mantang people returning from wintering lower down. 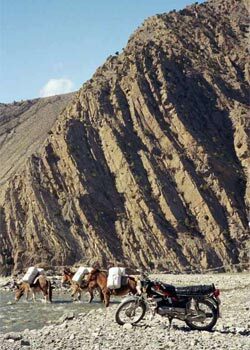 Distinctively Tibetan-looking people, theycarry everything for their winter trip on their horses. We all took advantage of the hot springs at Tatopani to soak his or her tired muscles. The food is good here too so we spent two nights to catch up with ourselves a bit. Good to relax with a beer in the dining hall, especially with James from the Gold Coast telling some of his vast array of jokes. As a retired airline pilot James has heard them all. Great to lie in till nine with a cup of tea and then NOT pack up. Day six was the toughest because it was a long one. There were a couple of stiff uphill trails into the pine forest and we stopped at the Eagle Nest Lodge, Ghasa, after crossing our longest, highest suspension bridge (don’t worry, its brand new). Despite an early start we didn’t get in till five o’clock. This is the first lodge to have a ‘hot table’ in the dining room – very popular. Kalopani seemed an easy trek after the previous day. Sweeties Lodge is renowned for its good food and Sweetie herself is a character. Some of the customers popped into Laxmi’s Kalopani Lodge to use the satellite phone. $3 per minute but worth it if you felt a bit homesick. The dawn ‘reveal’ of Daulaghiri was breathtaking and we were all up early to see it. The walk from Kalopani to Tukche is my favourite day. The weather was clear so we had great views of Daulaghiri till well after lunch at Larjung. The best thing about this day is coming out of the woods and farming country into the broad flat expanse of the Kali Gandaki valley. Euthy, Siu Ying and Helen were soon miles behind searching for fossils in the riverbed. These saligrams (prehistoric snails) get washed into the riverbed each monsoon season. Our lodge that night was in Tukche, an old salt-trading village, which has quaint architecture. Next morning we looked at the Gompa and the distillery, where purchases were made. The trail is dead easy now and the morning’s trek to Marpha flew by. One customer felt unwell so we put her on a motorbike taxi. Our accommodation in bustling Jomsom was a bit of a ‘fawlty towers’ kind of experience so I’ve arranged a different lodge for the next trek. On the flat walk to Kagbeni there is plenty of time to sit on a rock with your water bottle and share some munchies while you contemplate the unique beauty of the place. Kagbeni is a crumbling medieval ruin. As usual, the New Asia lodge gave us a warm welcome and our porters played and sang us up onto the dance floor in the evening. This was the day to ride up to Muktinath, but some, like Helen, had no experience at all. Most were pleasantly surprised that the horses had comfy saddles and just plodded along. It was a pleasure to look at the changing scenery without making much of an effort. The final destination on this trek is not really spectacular. The little gompa where you can see a flickering blue flame and hear an underground stream was rather touching in its simplicity. The floorboards were worn smooth by thousands of pilgrims through the centuries. Of course, the view’s not bad either. The walk back was long but easy and the fading light just made the whole thing look even more beautiful. Our last day of trekking was a great big blue-sky day. I bought a rare old Tibetan blanket at Eklai Bhatti. We dug around in a couple of curio shops in Jomsom but didn’t find any treasures – this time. With poor weather and snow flurries the night before our flight it was a relief when the planes started coming in around 7 am. The dawn clouds cleared and we flew between freshly snowed on peaks. Daulaghiri has never looked better. There were a few really keen shoppers on this trek (they know who they are) so we toured Lakeside and Maindrapul looking for bargains. Most of us bought clothes. Lucille from Alice bought very beautiful necklaces. T-shirts with ‘I’ve done the Anapurna Trek’ embroidered on them were a popular item. 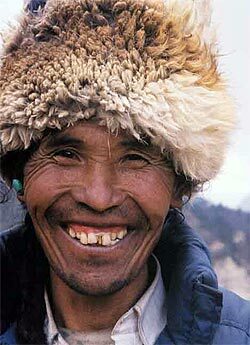 The Everest Trekkers were a real mixture. Three Kiwis, two Aussies and a Canadian who lives in Singapore. The Kiwis flew in early for a look around and hit the streets with our guide Dorje. I think its fair to say they hadn’t seen anything like this in Masterton. Soon Helen arrived from Australia and Ray flew in from India where he’d been looking at aid projects for his Church. Lou (or Alu as the porters called her) arrived at the last minute and we quickly buzzed around Thamel picking up trekking gear. Our flight to Lukla was exceptionally clear but the drop in temperature took us by surprise. Everyone bought a knitted hat within the first half hour. The walk to Phakding was not long but it was the first day at altitude so we were tired when we arrived. Nice wood stove in the dining room, simple rooms with great views. Day two on this trek was a bit too easy but it slows us down in order to acclimatize. Tantalizing glimpses of snowy peaks in the moonlight. Day three was a steep climb up to Namche Bazaar. This is never easy but we just plodded along and took breaks every few minutes. Some, like Helen from Apollo Bay and Jeff from New Zealand actually raced each other. Ugh!! Ray, at 75, had no trouble and set a steady pace. 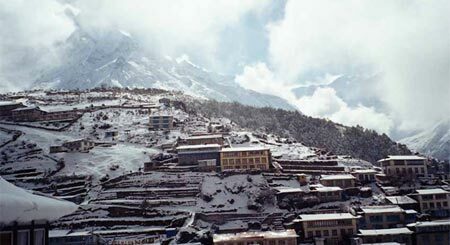 Namche was a revelation but within minutes of our arrival it started to snow. It snowed all night and the vision in the morning was marvelous. Blue sky, bright sunshine and a blanket of white over everything. Even the Yaks had snow on them. The air was crystalline and the group’s first proper view of Everest was as clear as I’ve ever seen it. This was our acclimatization day so we took the chance to check out Namche. Our next day was just a few hours round the corner to Kangzuma. The Lodge of Ang Tashi and Lagpa is a treat. 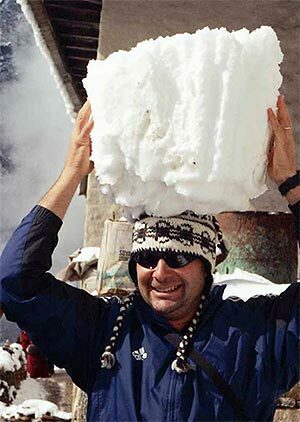 The fact that Lagpa has summited Everest twice (and several other mountains as well) made him a hit with the Kiwis. The hill up to Thangboche is possibly even harder than the one up to Namche. Slow–and-steady was the order of the day. The fresh snow had made the entire Khumbu Valley dazzling and the view from our lunch stop at Thangboche was unmatched on any previous trek here. Next day was a long hike up to Dingboche and most of us were really feeling the altitude by the time we arrived at 4350m. A long evening round the fire, a good nights sleep and most of us were fine in the morning. We had an extra night here in order to acclimatize for the ‘big push’ up to Kala Pattar. Several of our group had already decided that this was high enough for them so we split into ‘topsters’ and ‘downsters’ for the following few days. Young Jeff or ‘young dude’ decided to accompany his Dad down. In the end only Jeff senior ‘Jefferino’ and Helen Murnane pushed on. Its only two more days but they are tough days and not for everyone. The ‘downsters’ flew downhill to Phunki Tenga. The hill, which took three hours to get up, was descended in 45 minutes. There was no power at the lodge so we had to cozy-up in the old dining room and take candles to bed. This next day was special. It was Roger ‘Raj’ ‘s birthday. We had a long lunch at Ang Tashi and Lagpa’s lodge where an unfortunate British chap had to be choppered out. Everyone helped as best they could and Ray said a little prayer for the poor mans safety. In the afternoon we visited the Ed Hilary school at Kumjung where a brilliant painting caught Roger’s eye. His son bought it for his birthday, the artist (art teacher) brought it to his birthday party along with a drawing he had done that afternoon; a birthday cake appeared and guests dropped in. It was a birthday to remember. Bright and clear this morning. We took a trail through Kunde where we stopped to see the Hilary Clinic. The doctor was busy with a long queue of local and international patients so we didn’t get to chat. We visited the Gompa where we saw the ‘yeti skull’. A bit gruesome really. Far more interesting were the offering bowls on the alter made of human skulls. We took a trail I had not been on before which afforded us a great view of Everest, again, and tracked across the top of the Shyangboche airstrip. Descending through lovely pine forest we spent the night at Thamo. Most people don’t visit this village, except maybe for lunch. It is an interesting old place with a large nunnery or ani gompa. Alu and I visited it in the afternoon and watched them make exquisite little butter sculptures for a puja next day. Early in the morning Alu sat in on the ceremony, as a guest of honour, and then got a chance to plant potatoes on her way back to Namche Bazaar. I think it was her ‘magic day’ of the trek. Back in Namche there was hooting and hollering when we found Helen and Jeff, the two ‘topsters’ and their porters Kancha and Dorje. Despite Helen’s split lip (the cold wind) they were in very, very high spirits. They had made it and met Peter Hilary on their way down. Namche Bazaar mean Saturday Market so, being Saturday, we spent time checking out the market before we set off back to Phakding. The return trip was easy. Relaxed and happy we stopped to look at everything we had missed on the way up. Farming, building, planting, gardens, kitchens, livestock. We nearly lost a couple of boys at a village dance on the way. The return to Lukla went off without a hitch. It’s a stiff uphill climb for the last hour so we were all relieved to make it to the top. Our lodge here has a great menu and bar so the evening rocked along nicely. Even Helen got up on the dance floor – and NOBODY hates dancing as much as Helen. There was some serious shopping done in Kathmandu over the next couple of days. Lou had a giant antique Tibetan cabinet shipped back to Singapore I believe. The rest were a bit more restrained. Lots of clothes were given away to the porters to make room for new purchases in the luggage. Again, t-shirts with ‘I trekked Everest’ embroidered around a map of the area were a hot item. 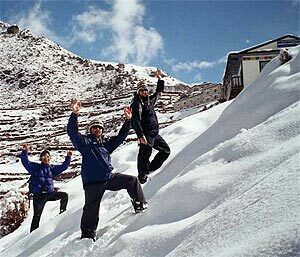 The Anapurna Trek is $1850 but the Everest Trek has had to be increased to $1950 as the flights to Lukla have increased. These are all-inclusive prices. You need spending money for personal items, trekking gear you might want to buy or rent in Nepal, and alcohol if you like it. I’ll cover everything else. I am sending these notes out to all of you who have expressed an interest in Trekking with Teresa in the past. Dates for the next trek have been set. 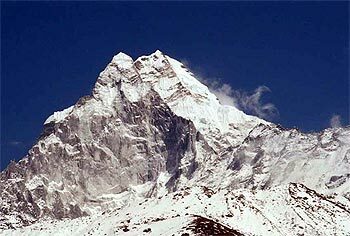 October 7 is the departure date for the Everest Trek. It returns around 25th October. 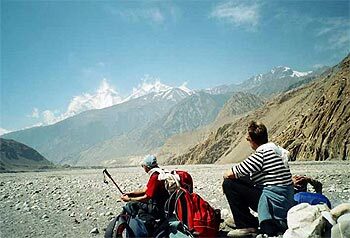 The Anapurna Trek heads out on 28 October and will return on 19th November. Of course I will be personally escorting both treks. I have half a dozen firm bookings for each trek and places are limited so do get in touch if this sounds like something you might enjoy.